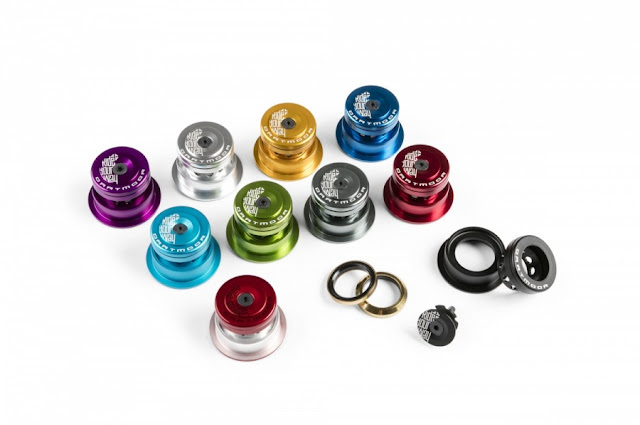 The Hightop Headset is a Campy spec integrated headset with a 20mm tall CNC’d 6061 aluminum cap with laser engraved logos, two sealed bearings and an aluminum compression ring. 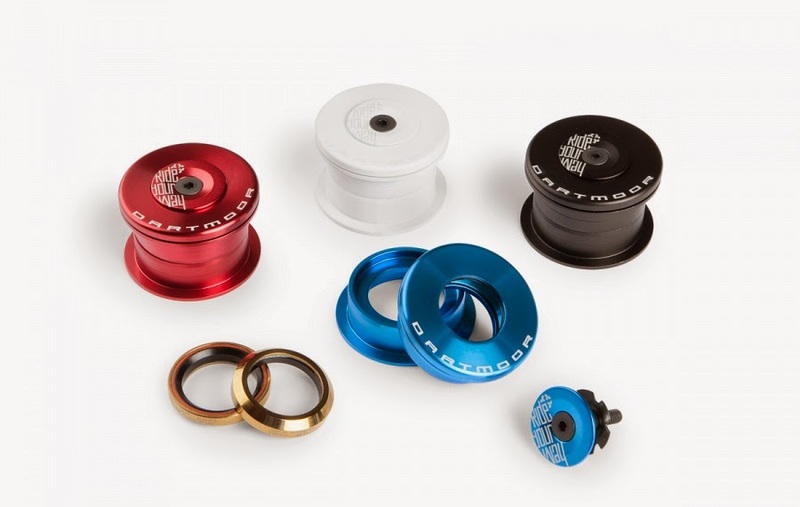 Keeps things simple and clean by removing the need for extra headset spacers.. The United Supreme headset follows the same path as the rest of the line. Two precision sealed 45° x 45° bearings encased by 7075-T6 alloy top cap and variable 5mm & 2.5mm spacers, so you can adjust that front end to just how you like it. Top quality headset with integrated top and bottom parts. IS42/IS52 type for tapered head tube and both types of forks, with 1-1/8” and tapered steerers. Ultra low profile top cover made of 2014 aluminium. High quality precision sealed 45/45 bearings with anti-rust titanium coating. Custom Ride Your Way compression cap included. They come with two steel crown races, one for tapered and second for 1-1/8” forks. Fitting Roots, Wish 2014, Hornet 2014, Hornet 4X, Primal, Primal 29 and Gamer Dartmoor frames. 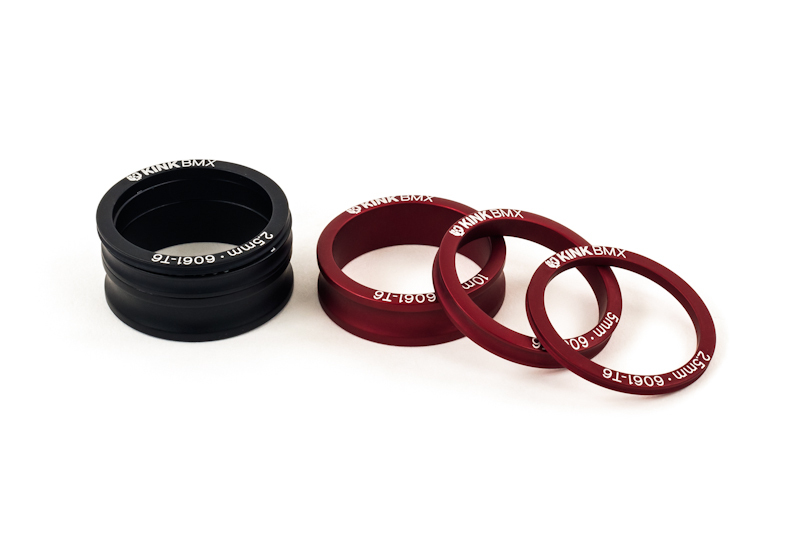 Top quality headsets for tapered head tubes and forks with standard 1.1/8” steerer tubes. Cups and top cover made of 2014 aluminium. Threadless upper cup drilled for weight reduction with ultra low profile top cover. Semi-integrated lower cup with 1.1/8” reduction integratet in the cup’s body. High quality precision sealed 45/45 bearings with anti-rust titanium coating. Custom compression cap included. Designed to fit Shine, Wish, Two6Player, Phantom and Hornet frames. Weight: 109g / 3.84oz. (without top cap). Assembly dimensions: 34mm (upper) / 49,57mm (bottom). Top quality headsets for tapered head tubes and forks with tapered or standard 1.1/8” steerer tubes. Cups and top cover made of 2014 aluminium. Both threadless cups drilled for weight reduction. 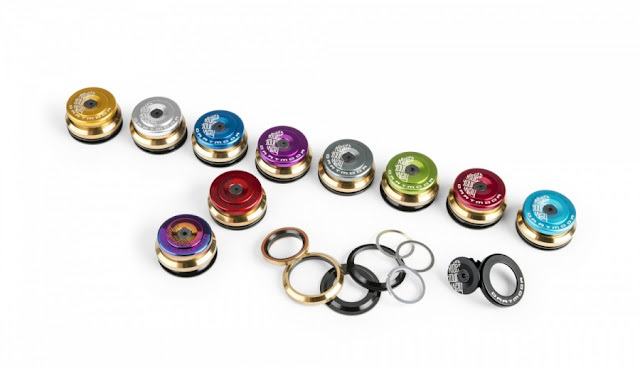 High quality precision sealed 45/45 bearings with anti-rust titanium coating. Custom compression cap included. Now they come with two steel crown races – for tapered or 1.1/8” forks. Weight: 126g / 4.44oz. (without top cap). Top quality headset with integrated top part and external bottom part. IS42/EC44 S.H.I.S. type. Ultra low profile top cover made of 2014 aluminium. High quality precision sealed 45/45 bearings with anti-rust titanium coating and special high density grease protecting against water penetration. They come with two steel crown races, one for tapered and second for 1-1/8” forks. Fitting new Cody frame with tapered head tube. Top quality headset with zero stack (semi-integrated) top and bottom parts. ZS44/ZS56 type for tapered head tube and both types of forks, with 1-1/8” and tapered steerers. Cups and ultra low profile top cover made of 2014 aluminium. High quality precision sealed 45/45 bearings with anti-rust titanium coating. Custom Ride Your Way compression cap included. They come with two steel crown races, one for tapered and second for 1-1/8” forks. Weight: 120g / 4.23oz. (without top cap). Top quality headset with zero stack (semi-integrated) top and bottom parts. ZS44/ZS49 S.H.I.S. type. Cups and top cover made of 2014 aluminium. Bottom cup with integrated 1-1/8” reduction. High quality precision sealed 45/45 bearings with anti-rust titanium coating and special high density grease protecting against water penetration. Designed to fit Transition frames and most of the other frames with the same head tube standard. Weight: 142g / 5.01oz. (without top cap). Assembly dimensions: 44mm (upper) / 49,57mm (bottom). Light and strong headsets for tapered head tubes. 1.1/8” semi-integrated upper cup and 1.5” a-head lower cup for tappered fork steerer. With Ride Your Way custom top cap. Alu cups (bottom drilled for weight reduction). 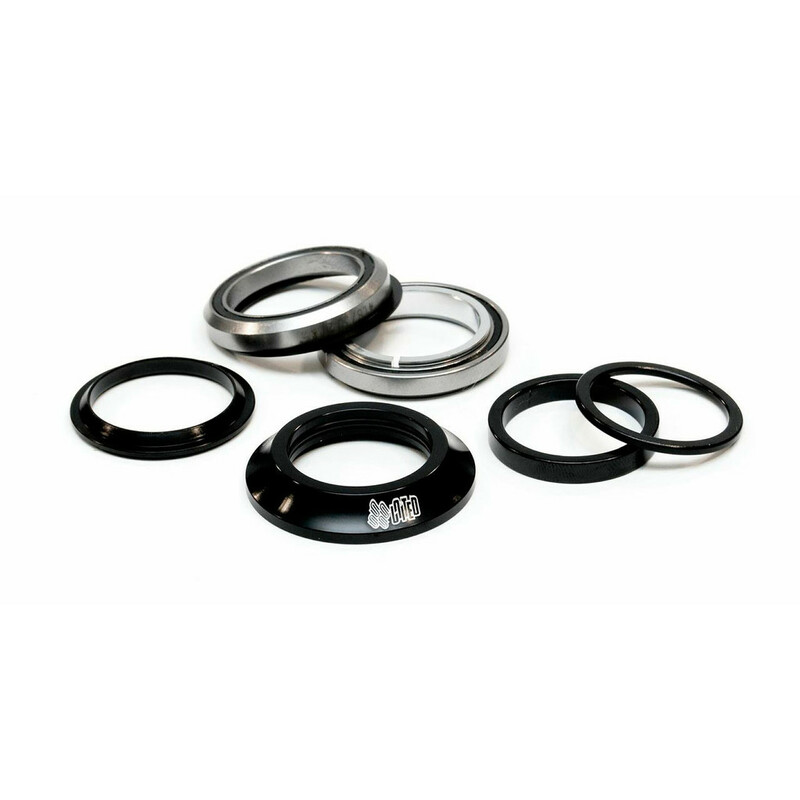 Sealed 45°x45° Cr-Mo bearings with anti-rust titanium finish. Weight: 122g / 4.3oz. (without top cap). Top quality headset with zero stack (semi-integrated) top and bottom parts. ZS49/ZS49 type for tapered head tube and both types of forks, with 1-1/8” and tapered steerers. Cups and ultra low profile top cover made of 2014 aluminium. 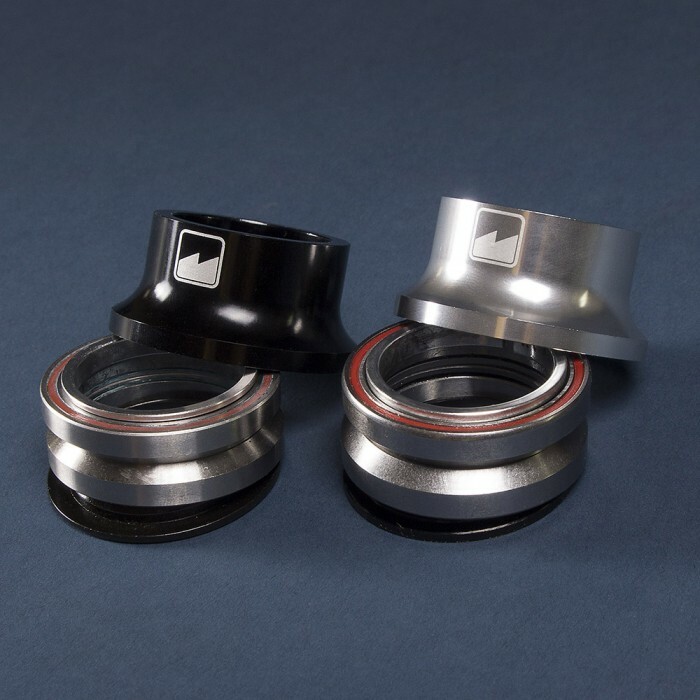 Both cups with integrated 1-1/8” reduction. High quality precision sealed 45/45 bearings with anti-rust titanium coating. Custom Ride Your Way compression cap included. Weight: 106g / 3.74oz. (without top cap). 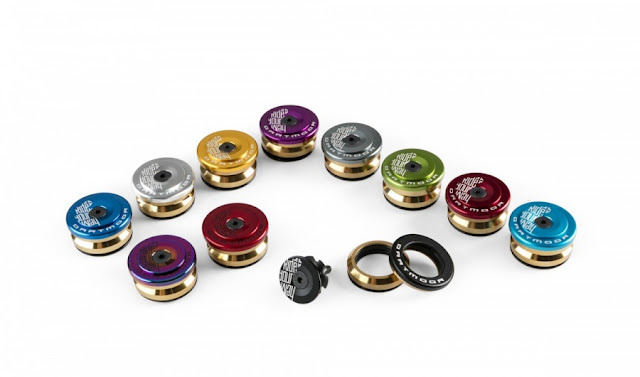 Ultralight and durable 1.1/8” headsets with custom body shape and custom Ride Your Way top cap. Deep cups for better alu head tubes protection drilled for weight reduction. Low profile top section. Cups and top cover made of high quality alu 2014. Sealed 45°x45° Cr-Mo bearings with anti-rust titanium finish. 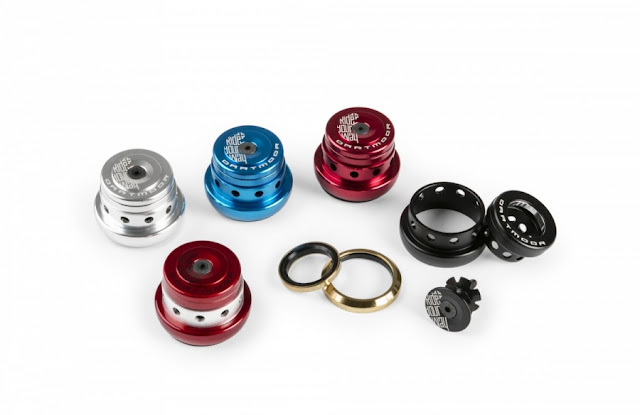 Oversized lower bearing for increased durability and trouble-free riding. Weight: 99g / 3.49oz. (without top cap). Top quality headset with integrated top and bottom parts. IS42/IS42 S.H.I.S. type. Top cover made of 2014 aluminium. High quality precision sealed 45/45 bearings with anti-rust titanium coating and special high density grease protecting against water penetration. Fitting Cody, Ghetto, Quinnie and Freaky MTB frames and Thug, Nami and Yuki BMX frames. Weight: 61g / 2.15oz. (w/o compression cap). 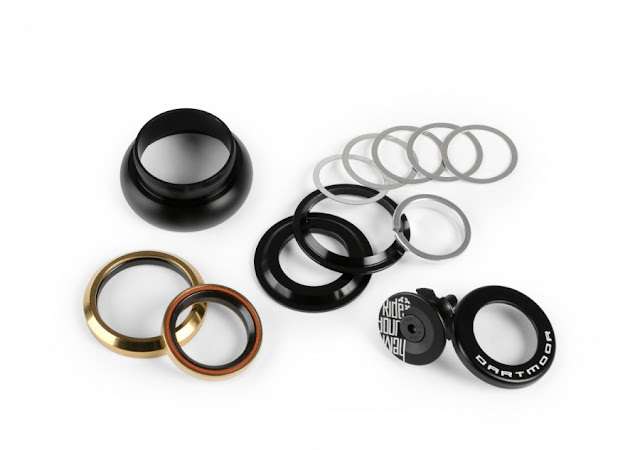 Available spare parts: bearings, compression top cap. Light and low stack height 1.1/8" headsets. Cups and top cover made of alu 6061. 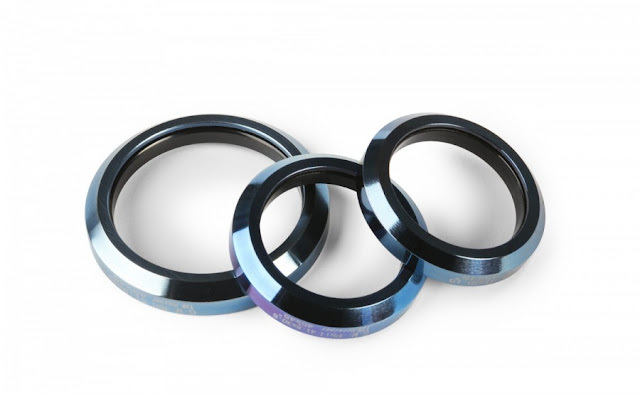 Sealed bearings made of Cr-Mo steel. Deep cups for better alu head tubes protection. Extra low profile top section. Weight: 85g / 3oz. (without top cap). Our custom designed top cap with Ride Your Way logo. Bolt and star nut included. Weight: 23g / 0.81oz. (with bolt and star nut). High quality precision sealed 45/45 Angular Contact Bearings (ACB) with anti-rust titanium coating in golden color. With special high density grease protecting against water penetration. Available also in option with blue titanium coating with special feature including two ceramic balls for better dirt removing.